It’s that time again – and this month, we’re bringing you the latest class action news involving problematic pressure cookers, oil-hungry GMCs, and two cases against Facebook and YouTube that involve how your personal data gets used. There’s a lot going on, and this newsletter’s just a taste of what we have on our site, so be sure to check it all out on ClassAction.org. But for now, read on! 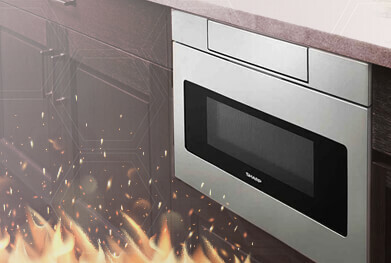 Certain Sharp drawer microwaves may be defective and pose a fire risk. People have reported an electrical burning smell, buzzing, puffs of smoke, and fires – even when using the microwaves properly. Attorneys are working with us to determine whether a class action lawsuit can be filed and are looking to hear from anyone who owns this microwave. It’s believed that the problems may be caused by the microwave drawer’s “magnetron” – a kind of fuse – which can stop working properly, forcing other components to overheat after trying to compensate for the lost power. If you had problems with your Sharp microwave drawer, share your story and learn more about taking part in a possible class action lawsuit on our dedicated page. You may have already heard about complaints from Chevy Equinox drivers saying that their cars are burning through a quart of oil every 1,000 miles – far more than should be expected for vehicles of this kind. We reported the issue back in August, and a class action lawsuit was filed against General Motors on behalf of Equinox drivers. Attorneys working with ClassAction.org have reason to believe the excessive oil use may also be a problem in 2010 – 2015 GMC Terrains and have now extended their investigation to these models. If you had an issue with oil consumption in your GMC Terrain, get in touch here and learn more about how a class action lawsuit could help you recover the cost of oil changes, oil you purchased to carry around in your vehicle, and loss of your car’s value. In 2016, Tristar’s Power Pressure Cooker was the center of a class action lawsuit alleging that the cookers had a serious design flaw. The plaintiff in the case claimed that she suffered serious burns when hot soup exploded out of her pressure cooker - and stressed that she properly released the steam valve before opening the lid. Earlier this year, the company agreed to settle the lawsuit by offering extended warranties and credit to those who wanted to purchase new pressure cookers or other kitchen items. It’s great news for consumers – but Tristar is just one company, and it’s possible that other pressure cookers may also pose a risk. Consumers have also complained about pressure cookers made by Cuisinart, Maxi-Matic and others, with some claiming they had to visit the hospital to treat burns caused by the cookers. Class action lawsuits could very well force the companies to let consumers like you know if their products pose a risk or contain any dangerous flaws, as well as seek money to compensate for any harm done. You can read more right here, and get all the details about the Tristar case on our settlement page. Have you ever received an offer in the mail - most likely associated with your bank or credit card account - for accidental death and dismemberment insurance ? If so, and if you signed up for the deal, attorneys working with ClassAction.org want to hear from you. They’re investigating whether a lawsuit can be filed against the companies that helped offer the “perk” - often pitched as part of a customer appreciation program for bank and credit card account holders - but then allowed customers to be charged inflated prices. Customers who agreed to the “deal,” which may have provided $1,000 in free insurance, with an additional $300,000 in coverage for a nominal fee, are often charged a quarterly fee believed to be much higher than the normal cost of the insurance – and this may have been going on for years. Are you paying without even knowing it? Read on to see how you can find out if you’ve been charged. Did Verizon and AT&T work together to keep you locked to a single carrier? That’s the claim being presented in a lawsuit recently filed in New Jersey that says the companies agreed to push for restrictions on new eSIM technology – technology that would have made it easier for customers to switch their SIM cards without needing to go to physical stores. Together, the companies account for about 70% of the U.S. wireless market, and the suit claims they hoped to lock eSIMs to single carriers, protecting the companies’ business but limiting consumers’ options. Keep reading. The Children’s Online Privacy Protection Act (COPAA) is a federal law designed to – you guessed it – protect the online privacy of minors, defined as anyone under the age of thirteen. In practice, this means that child-focused apps and services cannot legally collect information about minors without verifiable parental consent – and, according to a proposed class action lawsuit, this is exactly what YouTube, and parent companies Google, LLC and Alphabet, Inc. have been doing. The plaintiff argues that YouTube makes no effort to attain parental consent or to keep parents informed about its data policies, despite the widespread use of YouTube by children under thirteen and the company’s admission that it tracks users over time and across multiple websites as part of its advertising business. The suit is seeking to cover a nationwide class of children under thirteen who’ve had data collected by the companies involved. Read more. A proposed class action lawsuit has been filed against Facebook, Inc. arguing that the company, as a business that sells consumer information to third-party advertisers, falls under the remit of the Fair Credit Reporting Act and, as such, should be subject to its regulations. The lawsuit claims that Facebook effectively compiles a consumer report on each user, similar to credit reporting companies like Experian or TransUnion, and should therefore provide users with a clearer sense of what information is being collected about them. If successful, the lawsuit could force Facebook to offer full disclosure on the data it collects from users, just as you can currently request from credit reporting agencies which companies receive your information and what they’re using it for. The timing of this suit is no surprise, with Facebook facing heavy questioning about how it collects and uses people’s information. The public is certainly concerned – but it’s unclear whether further regulation is the answer. Read on. A jury in Philadelphia has cleared Bayer Healthcare Pharmaceuticals and Johnson & Johnson’s Janssen unit after a patient claimed Xarelto was insufficiently labeled and failed to properly warn about the risk of internal bleeding. The patient claims he suffered a large bleed after using the drug for a week, and blamed the mixture of Xarelto and an antiplatelet medication. The court, however, heard that the doctors would not have changed their prescription orders if a stronger warning was provided and ruled that the Xarelto's labeling is appropriate.